Hearts v St Johnstone: Ikpeazu a doubt, Clare unlikely to be involved, 6 wins from 7? After Wednesday night’s thrilling Betfred Cup victory over Motherwell at a raucous Tynecastle, Hearts will be looking to get back to winning ways in the league when they welcome St Johnstone to Gorgie. Craig Levein’s men will be coming into the fixture against the Perth side with a spring in their step following the 4-2 win over the Steelmen in what as a topsy-turvy encounter, but one which ultimately saw Hearts reach their first semi-final since 2014. Despite dropping their first points of the season last Saturday to a dogged Livingston side, Hearts maintained their five point lead the top of the Ladbrokes Premiership. With a visit to a resurgent Rangers in store a week on Sunday, the side will be looking to ensure that buffer remains in place. The build-up to the match has been overshadowed by the fallout from the SPFL’s decision to schedule next month’s Betfred Cup semi-final for the same day at the same venue. Back to league business, Hearts will hope to welcome back Uche Ikpeazu despite the four goals scored during the week. The Englishman has missed the last two games. With Steven MacLean having led the line twice in the space of five days Ikpeazu would be expected to start if fit. However, MacLean will be desperate to feature against his former club. The team are likely to be in buoyant mood following Wednesday’s success which may see Levein start with largely the same team. Although, despite the result and positive performance, there were a couple of issues. Arnaud Djoum didn’t look comfortable playing on the left of a midfield four, while Demetri Mitchell is a much better player on the front foot than he is on the back foot. It could see the re-introduction of Ben Garuccio at left-back, meaning Mitchell may play on the left of midfield. Callumn Morrison, one of the key players against Motherwell, was substituted due to cramp but it was more of a precaution than anything serious. In terms of injuries Jamie Brandon and Christophe Berra are still on the sidelines, while Sean Clare may be involved. St Johnstone come into the game on the back of a two disappointing results. A thumping by Rangers in the league at Ibrox was followed by defeat to Celtic in the cup. Yet it has been a positive start to the season for the Saintees. Tommy Wright has recruited well, reducing the average age of the team, while adding more creativity and energy to the team, including former Hearts players Tony Watt, Danny Swanson and Ross Callachan. Watt may miss the game through injury after he was substituted at half-time of the to Celtic. It would be a blow to the Perth side with Watt having started the season well. But whether he makes it or not, Wright will likely bring forward David McMillan back into the team. The experienced manager, who is also missing long-term absentees Brian Easton and Murray Davidson, is aided by the fact he has a deeper squad than he has had at his disposal in recent seasons. 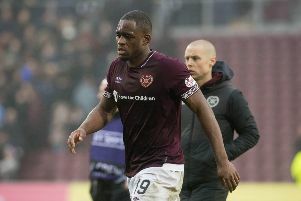 Hearts - Uche Ikpeazu should return to the squad following injury. Christophe Berra and Jamie Brandon remain on the sidelines. St Johnstone - Tony Watt is the main issue having went of injured against Celtic in midweek. Back-up goalkeeper Conor Mitchell misses out with an ankle injury which means Mark Hurst will take his place on the bench. Murray Davidson and Brian Easton continue to miss out. 57 - The number of goals Steven MacLean scored in more than 200 appearances for St Johnstone and he will forever be remembered in Perth for scoring the goal which sealed the club’s first ever Scottish Cup in 2014. The 36-year-old has netted four times this season for Hearts. A special reception is always reserved for Liam Craig when he comes to Tynecastle. The former Hibs player will be in the middle of the St Johnstone midfield and will have to contend with the Olly Lee who has been in fine form for the Jambos. Not only does he direct the play in the Hearts midfield with peter Haring but, as he showed on Wednesday, he has the ability to burst forward and provide a goal. No team has lost the ball more times than St Johnstone (765) in the league this season. This will provide Hearts with confidence of hitting Saints on the counter-attack. It is an aspect of Hearts’ play which has improved greatly on last season and they will be looking to add to their 108 shots - no team has recorded more in the Premiership. The presence of Nick Walsh on the team-sheets on Saturday may bring about a few red faces among some at Tynecastle. He was the man in the middle of Hearts’ outing at Cove Rangers, the game where Andy Irving was brought on as a substitute which led to a points deduction in the Betfred Cup due to registration issues. Walsh, who had his first international appointment in March this year, sent off Sam Nicholson 2017 for an alleged spit at an assistant referee during a defeat to St Johnstone. Hearts (4-1-4-1): Zlamal: Smith, Souttar, Dunne, Garuccio; Morrison, Haring, Lee, Mitchell; Naismith, Ikpeazu. Subs from: Doyle, Hughes, Dikamona, Bozanic, McDonald, Mulraney, Cochrane, MacLean, Djoum, Amankwaa, Clare. St Johnstone (4-4-2): Clark; Foster, Kerr, Shaughnessy, Tanser; Wotherspoon, Alston, Craig, Wright; McMillan, Kane. Subs from: M. Hurst, Anderson, Watt, Swanson, Nydam, Kennedy, Callachan, Comrie, Scougall, McClean.